There hasn't been a whole lot to say about Anadarko in the Haynesville Shale. 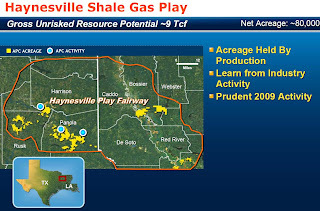 They are one of the biggest producers in the world and they have 80,000 acres in the Haynesville Play, but they haven't done much there to date. The big reason is that most of the company's acreage is held by production (HBP), so they are not on the clock to produce before the lease runs. Their strategy has been to watch and learn. The map below shows the company's acreage, most of which is located in East Texas. Anadarko has completed three vertical wells, as noted above, and scheduled a horizontal well for Q1 2009. I'm guessing the company clearly sees it as a long term play that will require a great deal of technical expertise. If they aren't in a hurry to drill, it behooves them to sit on the sideline to watch and learn, especially with such low gas prices.